Rainstorms and wet umbrellas can be problematic for property owners. An estimated 60% of all accidents on commercial properties are the direct result of how well— or how poorly— the floor surface is maintained. Floor mats and maintenance personnel must keep things neat and dry, which is a responsibility that becomes more difficult on days of inclement weather. Not surprisingly, property owners and facility managers often turn to additional safety products, like wet umbrella bag stands, to help keep floors dry and safe throughout the day. When selecting facility safety products, it is helpful to first understand the main causes of dirt, debris, and moisture accumulation. Shoes are perhaps the most well known contributors of facility debris, and the level of dirt and grime carried through the entry way worsens as precipitation increases. Wet umbrellas are another means by which rainwater gets carried into the facility, forming dangerous puddles in unlikely areas. Facility managers seldom hesitate to invest in commercial matting to contain the dirt and moisture carried by shoes. Wet umbrellas are an afterthought, and many managers rely on maintenance personnel to reactively clean the messes they make. As with all reactive strategies, reliance on cleaning personnel opens the door for potential slip and fall accidents to occur between the time a puddle forms and the moment it is spotted and cleaned. To narrow the gap, property owners and facility managers limit their exposure to liability by going the “extra mile” to keep properties clean, dry, and safe on rainy days. All that is required is a simple cost-effective investment in an umbrella stand, rack, or wrapper to help keep rain water in check. The first type of umbrella safety product is an umbrella stand. 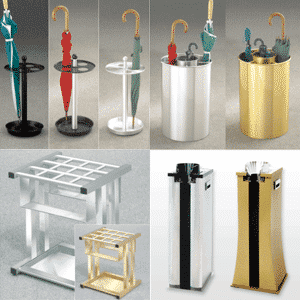 Umbrella stands are the oldest and most widely recognized of all products available. They might be simple in design, like the vertical stands and cans seen at commercial (and even residential) entryways. Umbrella stands are also available in rack form, designed to accommodate up to 36 umbrellas in a single unit. Stands, racks, and cans keep umbrellas in an upright or horizontal position so they dry more efficiently. Visitors must leave their umbrella in the unit, reducing the amount of rain water that is tracked beyond the entryway. Puddles are effectively prevented, especially when used in conjunction with entryway matting. Guests might erroneously take the wrong umbrella upon leaving the facility. Guests might forget their umbrella altogether. Property owner might be held liable for lost or mislaid umbrellas. A newer type of umbrella safety product delivers the best of both worlds by allowing guests to retain possession of their umbrella while also eliminating the threat of rain water runoff. These units are positioned at the entryway, and they have an automatic wrapping mechanism that envelops the wet umbrella in a disposable plastic bag. In one fluid motion, guests insert their umbrella and remove it fully bagged. Effectively controls rain water runoff on stormy days by completely enveloping wet umbrellas in an elongated plastic bag. Reduces rain water accumulation on smooth entryway floors. Enables guests to retain possession of their umbrella throughout the duration of their visit. Delivers a “wow” factor that cultivates a positive first impression with guests. More expensive than traditional stands, cans, and racks. Automatic Umbrella Wrappers are preferred by high end residential complexes, hospitality destinations, retail outlets, hospitals, and other public properties where safety and customer experience enhancement are vital. At Umbrella Bagger, we are passionate about providing commercial-grade safety solutions tailored to meet the needs of any commercial or public property. To learn more about umbrella stands, cans, and new Automatic Umbrella Wrappers, call Client Services at 855-328-8100. Free Shipping and Price Match Guarantee. To ensure our customers get the right product at the right price, Umbrella Bagger now offers Free Shipping and a 100% Price Match Guarantee for all online orders!